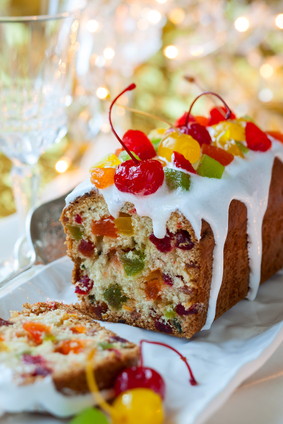 Marie Rudisill, also known as The Fruitcake Lady, got her nickname from writing about fruitcake. Her book, Fruitcake: Memories of Truman Capote and Sook, preceded her appearance on The Tonight Show with Jay Leno. In fact, it precipitated her appearance when she sent a copy to a producer of The Tonight Show with a letter chastising Leno for his fruitcake jokes. Q. What do you do with a Christmas fruitcake? A. Try eating it! Hey! It’s one way to get rid of it! 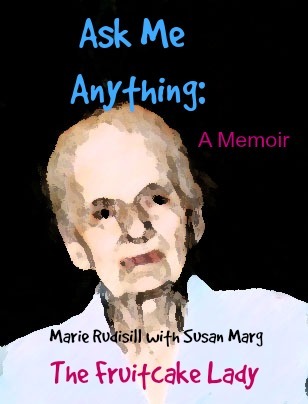 Seriously, Marie’s book is a gem. She reminisces about growing up in the Old South, family traditions, her nephew Truman Capote, and their cousin Sook Faulk, whom Capote memorialized in A Christmas Memory. And, of course, she includes over twenty recipes. Can’t wait to get started? Here’s one Martha Washington is said to have used. Cream together a 1/2 pound butter and 1-1/2 pounds sugar. Gradually add six beaten egg yolks until creamy; then dissolve a teaspoon of soda in one pint of sour cream and add, alternating with 1-1/2 pounds of flour. Next, add the whites of the six eggs, beaten stiff.